Chocolate Milk Was First Introduced For These "Healthy Medical Benefits"
Plenty of people have fond memories of growing up drinking chocolate milk with their school lunches, which usually consisted of processed, breaded chicken, something that resembled mashed potatoes, and sugary, canned fruit that passed for “healthy.” Chocolate milk was an easy way to get kids to get the calcium that dairy provides, and with a fat content lower than whole or even reduced-fat milk (albeit with hefty amounts of sugar added). Up until Michelle Obama began pushing for healthier school lunches, plenty of people probably believed that they were doing kids a favor by getting them to drink chocolate milk. School lunch servers and politicians squabbling over the supposed health benefits of drinking chocolate milk aren’t the first to tout its alleged health benefits. In 1909, an ad for Ovaltine, a powder used to make chocolate milk, touted its incredible health benefits, including its easy digestibility and farm-fresh ingredients that made it a complete food choice. It was given to people who needed nutritional supplementation, which is similar to Ensure today. People were legitimately convinced that this sugar-loaded confection was genuinely a health food. Besides, with medical opinion in their sugar coma-induced favor, who was likely to argue? Ovaltine advertisement in a medical journal, 1909. thevintagenews. In the cult-classic movie A Christmas Story, the main character, Ralphie, drinks as much Ovaltine as he can, in between wishing for a shotgun for Christmas. He does so to get the advertised prize, which, to his chagrin, ends up being nothing more than a coded message to drink more Ovaltine. Though Ovaltine is no longer marketed for its farm-fresh egg and malt base (the original name was “ovo-malt-ine”), it continues to sell its product as a health food because it is heavily fortified with vitamins and minerals. For those who are concerned about the high sugar content, they can get varieties that are sweetened with artificial sweeteners. Nutritional information for Ovaltine. Amazon. Ovaltine is far from the only chocolate milk product that is still marketed as a health food. Swiss Miss, now a part of ConAgra Foods, pioneered the sale of hot chocolate, which is also sold as a health food, initially to airplane passengers. Today, it is a brand name for hot chocolate (with or without marshmallows) and chocolate pudding, both of which have a “boosted” version that is enhanced with vitamins and minerals. Plenty of parents have long gotten their kids to start their days with “healthy” hot chocolate for breakfast before a carton of chocolate milk at lunch. Nutritionists today are banging the drum for better health, starting with removing sugar chocolate milk from kids’ school lunches. Even if the beverage is heavily fortified with vitamins and minerals, it is still very high in sugar and therefore, they claim, detrimental to children’s overall health. 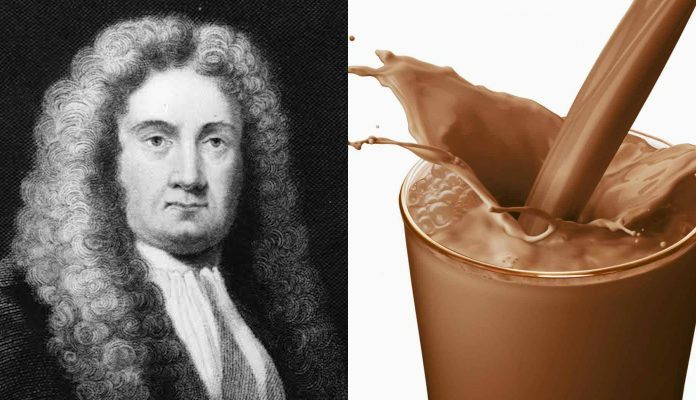 What they may not realize is that they are up against hundreds of years of history, because chocolate milk was originally introduced to Europe as a health beverage, by none other than a physician.